This client requested to have a portable panel installed along with an additional 300W of solar power on their roof. We provided a 120W portable panel from @zampsolar, and we installed a portable panel plug on their bumper for easy access. All they have to do is plug the panel in, put it a sunny area, and it will produce solar power. In the event they are parked in a shaded area they still have a way to harness the power of the sun. This Class B rig came to us with two 12V 100Ah Group 31 AGM batteries externally mounted under each side of the chassis behind rear wheels. The owner, Roger, was very clever to route ropes through his frame to pull wires prior to him building out the interior. 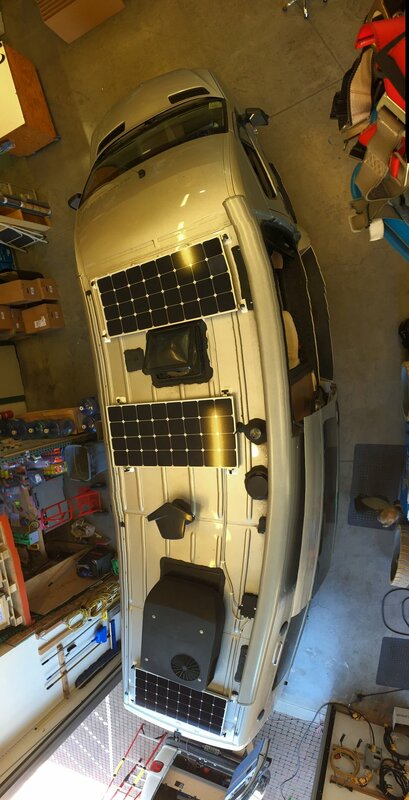 Roger also provided a shelf in the driver's rear wheel-well bay for mounting AM Solar inverter system.